A new Industrial Revolution is underway, accelerated by the Internet of Things* (IoT). The emerging world of IoT offers the opportunity for businesses to improve customer satisfaction by developing new products and services. Today most connected devices operate in siloes, preventing us from unleasing the IoT's full potential. The next generation WebRTC Data Channel** technology uses a peer-to-peer architecture that provides privacy measures, which in combination with Identity Relationship Management assure that confidential information can be accessed only by authorized parties. All WebRTC traffic is DTLS encrypted before it leaves the user's device. DTLS encrypted data channel ensures security for all participants. This technology allows for ad hoc communication beyond traditional enterprise boundaries. WebRTC IoT Hub is a device running an agent that resides on premises and can be paired with a variety of sensors as well as third party connected devices/agents. The collected data are processed, encrypted and stored on the Hub device and periodically backup through cloud data storage services. The Hub agent enables users to directly connect, manage, and monitor all of their remote devices and sensors while still preserving privacy. This architecture could be possibly seen as a hub and spoke model, but the WebRTC IoT Hub peer is a more than just a typical agent service. It doesn't need a static ip address or domain identifier and it doesn't need to listen on specific open port. Every single WebRTC peer is de facto IoT in itself; therefore this model can be seen as a smart client architecture. As more home appliances, thermostats, lights come online; linking them under one control is the next step in making smart homes. 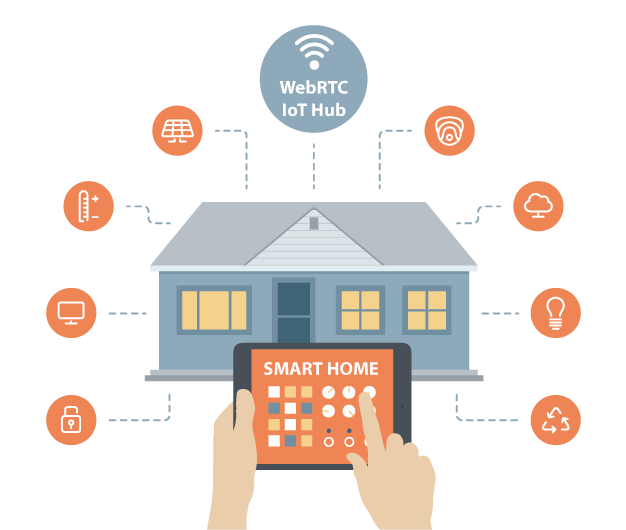 The WebRTC IoT Hub is designed as a central unit of the smart home control system residing on premises behind a WiFi gateway. Users can remotely communicate with various home devices and appliances from Android or iOS app. A new wave of IoT-enabled systems in a manufacturing area refers as Industry 4.0 in Germany and Smart Manufacturing Leadership Coalition (SMLC) in the United States. The basic principle of intelligent manufacturing system is a network of people, machines and sensors continuously connected and communicating. This system is extended to interconnected factories. This is where the WebRTC IoT Hub comes into play as a communication and management system. Proactive maintenance - machines that predict failures and trigger maintenance processes autonomously. Connected Supply Chain - tracking, monitoring and reporting of inventory, parts and products as they move through the supply chain. The healthcare industry is one of the best candidates for IoT technology usage. Having the right information at the right time is key to effective healthcare. Clinicians need quicker and easier access to critical data to help them make better decisions. The WebRTC IoT Hub makes the gathering and transferring of medical information safe and efficient. Patient monitoring - remote, continuous monitoring of a patient's health. Network-of-care - interconnected physicians, hospitals, clinics and medical devices. Telehealth - the delivery of health-related services and information to treat patients remotely. * Cisco talks about the Internet of Everything (IoE); defined as bringing together people, processes, data, and things to make networked connections. ** WebRTC Data Channel is a real-time peer-to-peer data transfer technology that can run not only between browsers as stated in the specification, but also on servers or other applications.